Is your office in the 90% for wellbeing? I have a background in the fitness industry - as a coach, trainer and other leadership roles. So I’m used to talking about wellbeing as part of my everyday life. But how many companies are truly thinking about their wellbeing strategy? Here’s a fact for you: In the UK, fewer than 1 in 10 organisations currently have a stand alone wellbeing strategy that supports the wider organisational strategy. Why is that? It could be because there are too many schools of thought on what, exactly, wellbeing means. It’s too big of a web to untangle, so many employers just ignore it. But what you should know is that it’s no longer possible to have a one size fits all solution that engages all of your employees all of the time. It’s not about crisis management and fixing problems. It’s about helping your people live better and feel better by facilitating and supporting them to make small sustainable lifestyle changes that really stick and make a BIG difference. 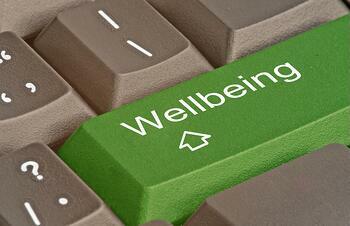 So the first question we really need to ask is this: What does wellbeing mean to your employees? Is it feeling good, is it eating well, is it being active or being healthy, is it sleeping well, reducing stress, managing your money, meditating or simply managing a busy work and personal life… The list goes on. Wellbeing means something totally unique to each and every one of us and will be practiced in many different ways throughout our lives, likely to change as our needs as individuals change. So the answer is it means all of those things - eating well, feeling “good,” feeling financially healthy - and many, many more. This makes it increasingly harder to put the right health and wellbeing strategy in place. But you must uncover the underlying issues to suit the needs of your individuals at work. Working life is moving faster than ever, placing higher demands on our people and our organisations to keep up. With the growing awareness of wellbeing and the impact of poor physical and mental health we are facing greater responsibility for our employees wellbeing. An increased sense of wellbeing will lead to greater happiness at work, and increased employee engagement, which as we all know is essential to a corporation’s success. Which brings me back to my original point. If you’re part of the 90% that isn’t focused on wellbeing, it’s time to change your thinking. Yes, wellbeing initiatives can happen in your organization, no matter what kind of organization you run! Here’s the trick: Align your wellbeing strategy with your core culture and develop initiatives that add to, not take over, your employees’ habits. Remember that we are all unique, and we all have different wellbeing goals and needs. And, like all great strategies, improving your workplace wellbeing won’t happen overnight. Ensure that you take a holistic approach and cover the key pillars of wellness - we suggest Physical, Mental and Financial as a great place to start. We’ll go over how to make wellness a part of your everyday in upcoming posts, and how you can incorporate it into your existing employee engagement tools, too. So tell me, are you in the 90%? And when will that change?